« “Vintage” Les Paul Wiring: BS or BFD? It Pays to Have Cool Rock Star Friends! Sadly, it's ony Photoshop. Jane just WISHES she had a Hello Kitty triple-neck! It was a perfect weekend here in SF: Unseasonably warm weather. BBQ in the garden. A fun recording session for a new project by Jane Wiedlin and Belinda Carlisle of the Go-Gos. And there was something else. . .
Jane suggested blinging it out with lots of beads and jewels and other eye-catching decor. And Jane know her eye-catching decor — her place is filled to bursting with mid-20th century kitsch, and her steampunk-themed studio could be the Addams Family basement where Wednesday and Pugsley rehearse with their punk band while Lurch runs Pro Tools. 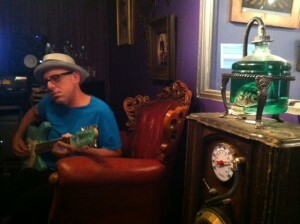 How often do you get to record 12-string overdubs while sitting next to a disembodied brain floating in a tank? Which one is better? Don't ask me! I’m also thinking onboard effects, though I’m torn between just adding a nasty fuzz via a push/pull pot, thus preserving the original one-knob layout, or gouging extra holes and adding a hellacious Ugly Face circuit. Got any suggestions, gang? I really want to freak out Jane next time she sees the guitar — and I have a hunch she’s not easily freaked. I need your advice, especially since I can no longer consult the disembodied floating brain. No ideas for parts? Consult Jane's brain! And how does my wonderful new guitar sound and play? Who cares! Better than you might think. The frets are a bit cruel, but the intonation is solid. The sound is surprisingly decent. (Yes, we did use it on a track.) And who knows where it will go with some crafty customization? And if nothing else, skilled Photoshop professionals can take comfort in the fact that I will no longer be posting quite so many crappy pics featuring the same Hello Kitty image over and over. Now I can take crappy photos from life! 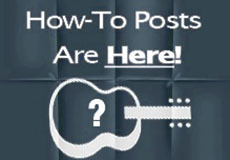 24 comments to It Pays to Have Cool Rock Star Friends! Just saw this on the SDUGF, very nice! That guitar just has a lo-fi look. If it were my guitar, I’d give it that sound too. YMMV. If you install an Invader or similar ridonkulously overwound pickup, it might be a fun chance to mess with the (Lawrence) Wilde Q Filter or similar inductor circuit. One popular implementation makes it basically act like you’re un-overwinding the pickup as you turn the knob. Concentric knobs, one volume, one for thickness, and you could get a lot of sounds out of that kitty without drilling. 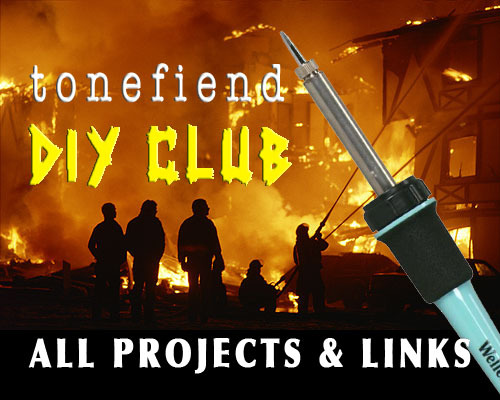 There are definitely circuit ideas with inductors that are about eq and filtering. But I was trying to describe something else. I have a slight awareness of a circuit application that puts an inductor in parallel with the pickup which effectively makes a pickup act more lightly wound. It sounds like turning the knob will act kind of like a variable coil tap. For vintage wound pickups, it’s reportedly a bit too subtle, but for highly overwound pickups, being able to also grab sounds that progress down to something closer to vintage wound, well, that’s interesting flexibility. I really dug the one knob “stoopid” fuzz you built a while back. Maybe a tweaked variation on that? Something thinner and clankier, to contrast the massively thick humbucker you’re sure to use. As far as the pickup goes, maybe the 59/Custom hybrid, or the Dimebucker, or even the custom shop Hawkbucker (I’ve always wanted to hear a demo of that). Not trying to disuade you from the Invader, I’m just throwing ideas around. I actually have this particular guitar, and I haven’t decided what to do with it, so I’m interested in what you put together. 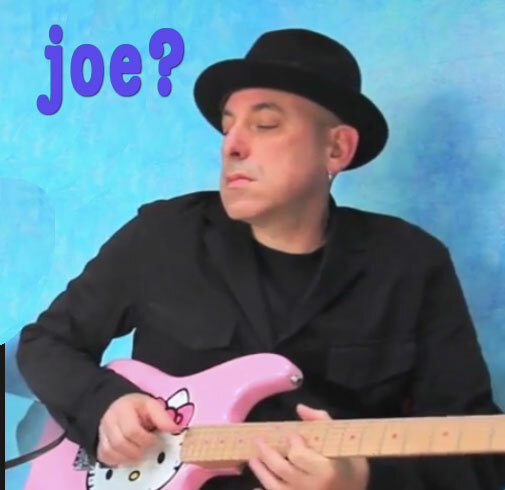 A purrfect Mental99 guitar. And now that you have a truly classy axe you can stop playing that silly old rusted out french thing (and give it to me). But seriously I do like the idea of a Metal99 guitar with Sysnyster Gates pickup (white little buttons) and maybe a yellow momentary on/off button on kitty’s nose. install an overdrive circuit and preserve the single control. Onboard Theremin? 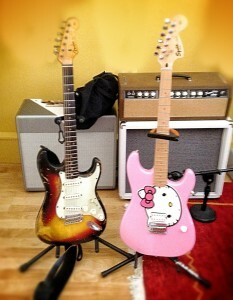 Some proximity sensor gizmo under the Hello Kitty pickguard? You should go to an arts and crafts store and go wild. They have all sorts of little figures, adornments, doll eyes (my personal fave), rubber stamps, stickers, doll house parts, decals, stencils, paints of all types dried and plastic flowers. 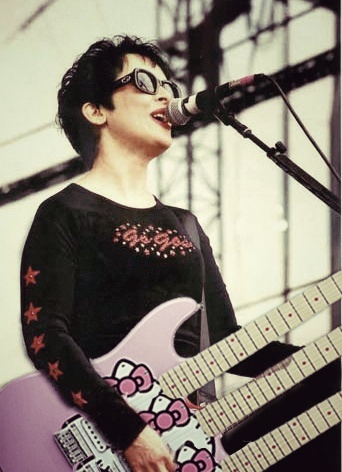 You might also want to look for Hello Kitty memorabilia to add to the guitar. Flashing LEDs might also look the part,you can buy LEDs with built in flasher circuits. I think you can leave the electronics as is, how could you improve on Hello Kitty technology? Jane Weidlin is TOO COOL! I always loved her style of playing. Anyway – you can keep the single knob look, but get extra control using a concentric pot like the old Danelectros. I was also thinking that it would be cool to give this pink monster some infinite sustain. I don’t know if it can be done without modifying the look of it though.